Take the 5×5 Challenge with Mike Seeklander! | Firearms, Edged Weapons, Fighting Fitness and More! 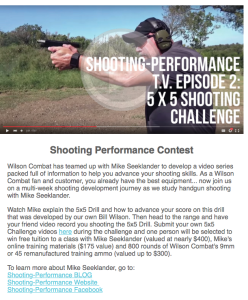 Wilson Combat has teamed up with Mike Seeklander to develop a video series packed full of information to help you advance your shooting skills. As a Wilson Combat fan and customer, you already have the best equipment… now join us on a multi-week shooting development journey as we study handgun shooting with Mike Seeklander. Watch Mike explain the 5×5 Drill and how to advance your score on this drill that was developed by our own Bill Wilson. Then head to the range and have your friend video record you shooting the 5×5 Drill. Submit your own 5×5 Challenge videos here during the challenge and one person will be selected to win free tuition to a class with Mike Seeklander (valued at nearly $400), Mike’s online training materials ($175 value) and 800 rounds of Wilson Combat’s 9mm or 45 remanufactured training ammo (valued up to $300). 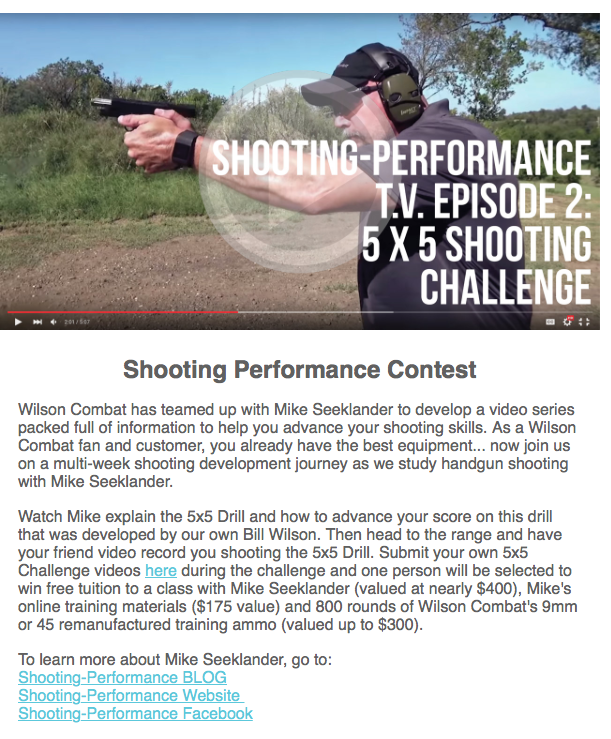 Each week Wilson Combat will release a video on the Shooting-Performance Youtube page. The videos will break down key techniques and offer one drill for you to train with. It’s all free, and designed to increase your skill! Take The 5 x 5 Handgun Test. Live today! The Draw Process – Concealed Carry.